World Wind & Solar's headquarters is in the process of a remodel at 228 Tehachapi Blvd. The front entrance of World Wind & Solar's new headquarters at 228 Tehachapi Blvd. The building is soon to be occupied. World Wind & Solar is making swift progress on its soon-to-open downtown headquarters, finishing inside reinforcement of the building, adding workstations, and completing outside architectural improvements at 228 Tehachapi Blvd. The building is 90 percent complete and is expected to open in two weeks, pending an occupancy permit. The 108-year-old structure was last used by Ace Hardware and needed costly restoration to bring it up to current building codes. World Wind & Solar was first interested in the building in 2015, with a decision to restore it coming later. The company's interest in finding new locations started in 2008, when the Tehachapi Transmission Project developed in the area to upgrade high-voltage transmission projects for wind energy, said Cummings. 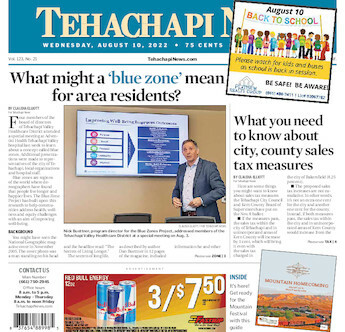 “Tehachapi is centrally located in the state, rendering it well-positioned when dispatching technicians to other high-density renewable project areas, including Palm Springs, Blythe, East San Diego County, the San Joaquin Valley and Altamont Pass,” added Cummings. People interested in the field of solar and wind careers will be able to take advantage of a state-of-the-art campus that will provide safety and technical training to the company's workforce in the field. The center will be furnished with simulators, wind turbine products, switch gears, and central inverters for hands-on training. “WWS is leading the charge for service providers to step up and truly educate our teams. The campus and our WWS Mobile University are completely revolutionizing how training is done in our industry. Our mission is to train, equip and deploy an elite workforce who are here to serve,” said Buddy Cummings, chief executive officer for the company.